The Swedish dish of Jansson’s Temptation uses a small amount of cream and spats to enliven a dish mainly comprising of the more mundane potatoes and onion. I am all for using a pinch of this, or a slice of that to lift a frugal dish, made with everyday seasonal ingredients, something rather more special. 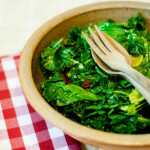 Here I flavoured a large quantity of seasonal greens using just a few slices of chorizo. If you gently fry the chorizo a slightly alarming amount of fat is released, delicious and full of flavour. It is perfect for seasoning what could otherwise be rather boring pile of greens, and, makes eating an extra portion of vegetables so much more enjoyable. If you try this Recipe: Greens with Chorizo please tag #FussFreeFlavours on Instagram or Twitter. It is amazing for me when for me when you make one of my recipes and I really do love to see them. You can also share it on my Facebook page. Please pin this recipe to Pinterest too! Thanks for reading Fuss Free Flavours! Simply fry the chorizo at the bottom of a wok until it is crisp and has released most of its fat. 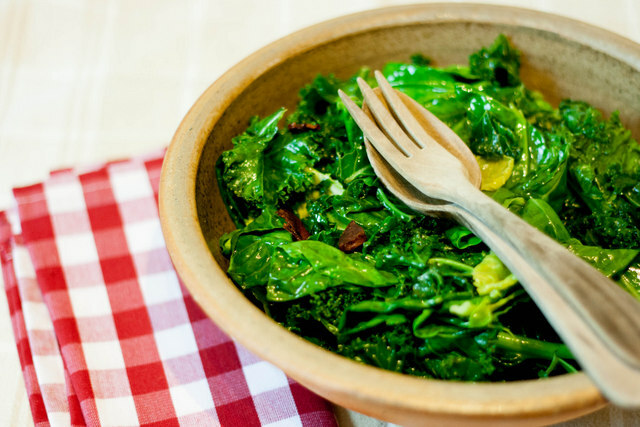 Wash and prepare your greens – leave in a colander and pour a kettle of just boiled water over them to wilt and start to cook. Give them a good shake and add to the chorizo. Stir fry until greens are cooked through and coated with all that delicious fat. Serve immediately, with a sprinkling of finely grated Parmesan or other hard cheese.